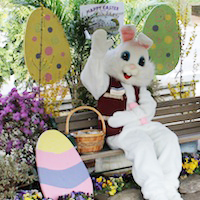 Picture with the Easter Bunny - Have your picture taken with "Hoppy", our very own Wilson Farm Easter Bunny. We'll post it to Facebook, so you can download a copy for yourself. Find the Bunnies - Follow the bunny footprints to find all 6 bunnies at the farm. Collect the secret letters, and unscramble the code to win an Easter Prize. Count the Easter Eggs - If you can guess the number of Easter Eggs in our display, you will win a fabulous spring planting kit. Bunny Bowling - Help our Easter Bunny knock down tasty carrots pins. The more you knock down, the cooler the prize. Egg Toss - Can you toss the eggs through the target? If you can, you will win an Easter surprise! For more information call: 781-862-3900. We HOPe to see you there! With Spring just around the corner, kids in Lexington are spending more time outside. You wouldn't allow your child to play in traffic, but allowing them open access to the driveway can be just as dangerous. Tragically, many driveway accidents involve a child playing behind a vehicle or a pet lying down being run over by a vehicle moving in reverse. Steep inclines and large SUVs and vans add to blind spots, making it difficult for drivers to see small children or animals. In a recent study of driveway accidents in New South Wales, published in the Medical Journal of Australia, Dr. Andrew Holland found that injury totals on driveways not separated by a fence or building from a child’s play area had triple the number of accidents compared to protected driveways. Dr. Holland studied 42 children (median age 2) admitted to the hospital with a driveway injury. Typically, injury involved a parent reversing a motor vehicle over a toddler or preschooler age in the late afternoon or early evening, with SUV-type vehicles involved in 42 percent of all injuries. Additionally, Holland studied 14 children who were fatally injured in driveways. As nearly all the fatalities were from head injuries, Holland believes the only effective way of reducing the death toll is through prevention. Much as a fence acts as a barrier around a swimming pool, Holland believes it's also the best option for preventing driveway accidents. "The optimal prevention would appear to be a clear separation of the driveway and garage from the children's play area by a physical barrier such as a fence," Holland says. Be sure the driveway is clear by walking around your car before you back up. Keep the driveway clear of toys, bikes and sports equipment. Keep your car locked and place the keys in a safe location inside your home. Warn your children not to play on the driveway. Teach your children to play in a protected area of the yard. By following these tips and using extra care when operating your vehicle, you can reduce your family's risk of being injured in a driveway-related accident by 50 percent. Buying a Lexington Home? 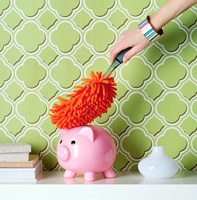 Don't Forget to Spring Clean Your Finances! Spring is just around the corner, even though the weather isn’t reflecting the warm breezes, budding flowers and chirping birds that we have in mind. But, soon we’ll be finding our way outdoors and enjoying all that Lexington has to offer! For many of us, the spring season means it’s time to undergo cleaning our entire home from top to bottom. And, while this is always refreshing and gives us that boost of energy for the warm weather season, we oftentimes will stop cleaning once we feel our home is in order. If you’re considering buying a home in Lexington this spring, it’s important that you take the time to spring clean your finances as well! Getting your financials in order can help you know exactly where you’re at before beginning your home search, and can help the home buying process run much more smoothly. As a Lexington Real Estate agent, I want to help you be as prepared as possible when buying a Lexington home, so I thought I would highlight some spring cleaning tips to help you succeed! 1. Review your budget- It’s helpful to make time to sit down and check your monthly budget. This will help you determine exactly how much you’re able to spend on a Lexington home. Also, if you are saving to buy a house, periodically reviewing your budget will help you get rid of unnecessary expenses allowing you to save more. 2. Review your financial emergency plan - Planning for unexpected events can give you peace of mind. A good rule of thumb is to have six months worth of expenses saved in an emergency fund. Don’t get discouraged if it takes time to build up your emergency fund, any amount is better than no savings at all. Also, make sure that if you become incapacitated, there is someone you trust to handle your finances. 3. Check your credit report and fix any errors- Banks are paying close attention to credit scores and, by law, consumers have the right to a free annual credit report. Take advantage of getting a free credit report, but always be sure to check out its accuracy. Many times, there are errors or may contain outdated information, which could affect your score negatively. If you do find a mistake, make sure you contact the corresponding credit bureau in order to dispute the errors. 4. Sign up for paperless statements - Signing up for paperless statements and paying your bills online will help keep your mail under control while saving trees at the same time. A lot of banks and credit unions offer online bill pay services for free. Take advantage of this and you’ll also be helping to care for the environment! 5. Consolidate accounts- When you’re budgeting, sometimes it’s helpful to separate accounts. But having many accounts can make keeping track of them difficult. When that becomes the case, it’s time to consolidate your accounts. Before making this decision, check with your financial institution to make sure there aren’t any penalties or fees for canceling an account. These tips should help you get organized and even better prepared for the Lexington home buying process. As always, if you have any questions about buying a home, entering the Lexington Real Estate market, or you’re ready to take the next step; please contact me today! Lexington Babe Ruth is in the process of forming its plans for the 2013 season. A MAJOR CHANGE in the LEAGUE FORMAT is taking place. We will now have a schedule that will include both games against in town teams and a schedule that includes games against out of town teams. We are excited about this format and believe it will increase the fun, development and competition environment within our league. REGISTRATION IS NOW OPEN. Please check back frequently to register and receive updated information. Managers Needed-- We are in need of managers for several of our spring teams. If we do not fill our manager spots soon we may have to cancel some teams or the entire season. Please contact us if you are interested in managing as soon as possible. RATINGS: We have yet to schedule ratings due to the lack fo managers, once we have managers in place we will be able to set a ratings date. 1. REGISTRATION FOR THE 2013 LEXINGTON SPRING BABE RUTH LEAGUE SEASON IS NOW OPEN. 4. PLAYER RATINGS FOR ALL 13 YEAR OLDS AND ALL PLAYERS NEW TO THE LEXINGTON BABE RUTH LEAGUE WILL BE REQUIRED. RATINGS ARE TO BE HELD AT THE LEXINGTON HIGH SCHOOL FIELD HOUSE AND WE WILL POST THE DATES AS SOON AS POSSIBLE, PLEASE CHECK BACK ON THIS PAGE FOR MORE INFORMATION. FOR THE RATINGS, PLAYERS SHOULD WEAR SNEAKERS, SWEAT PANTS, SWEAT SHIRT OR TEE SHIRT OR OTHER APPROPRIATE ATHLETIC CLOTHING. PLAYERS MUST BRING THEIR OWN BASEBALL GLOVE. PLAYERS ARE NOT REQUIRED TO BRING A BAT. HOWEVER, IF A PLAYER HAS A FAVORITE BAT, THE PLAYER IS ENCOURAGED TO BRING THAT BAT. 6. The fee for this years spring season will be $250 plus a small transaction fee for the online processing of the registration by the league.